We were only up in Edinburgh for a quick 2 night break so a quickfire plan needed put together. 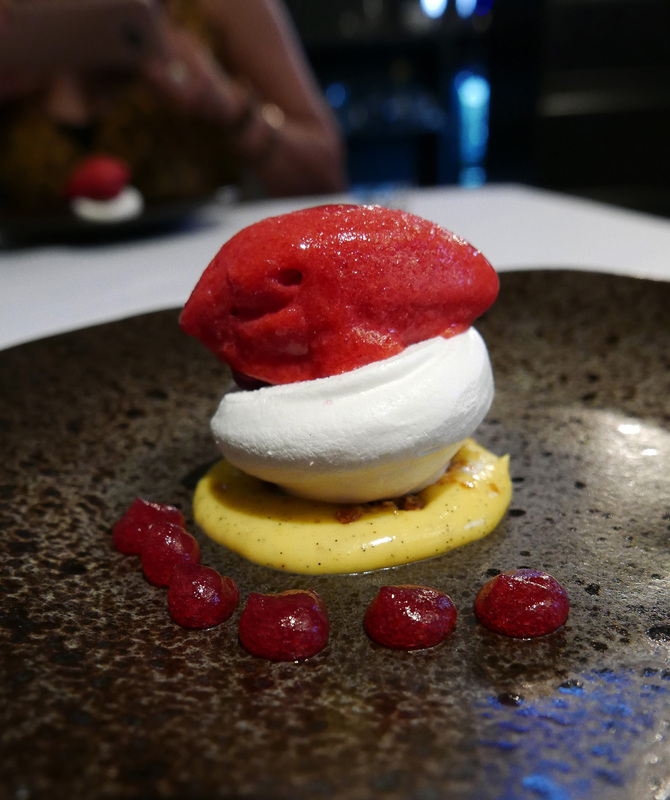 I decided to book somewhere totally new and contacted Chef Mark Greenaway to try out his restaurant in the city centre. There`s a couple of good cocktail bars close by (The Dome and Panda and sons ) but on this trip we chose pre dinner drinks at Tiger Lily. Marks restaurant is just around the corner so really handy for those wanting an exciting up market bar before they eat. 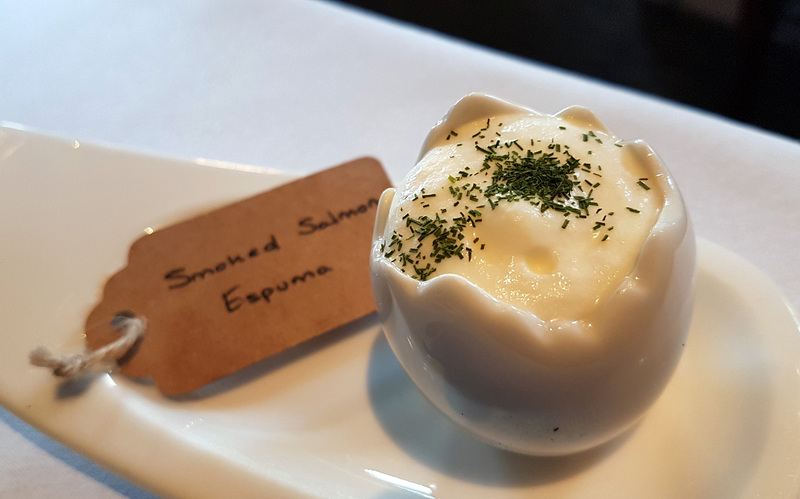 The menu started off with `Snacks to share` – Smoked Salmon Espuma / Beef , Juniper , Cream / Barbajuan with a Broccoli and Blue Cheese filling. We got a fourth snack in error so not sure what that one was , maybe a Vegetarian alternative. No complains though , spicy Tomato concoction to drink from the Egg cup. 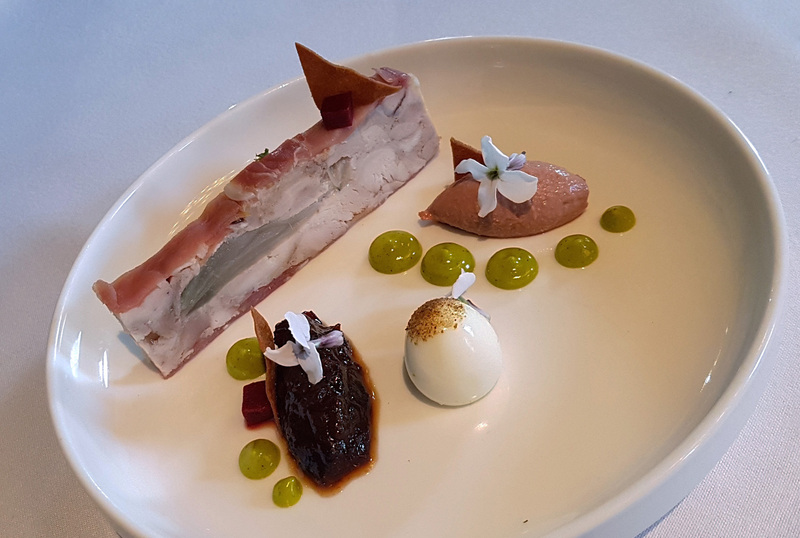 The tour menu got off to a very safe start with this Chicken Terrine , a lovely smooth quenelle of Chicken Liver Pate with Toast , Pickle and a Quail Egg. 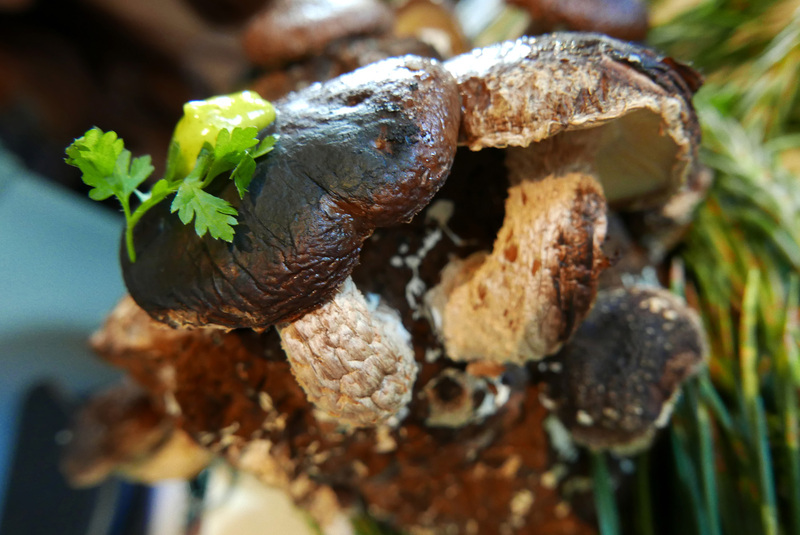 BBQ Shiitake Mushrooms , Sourdough , Truffle , Parsley – Straight into the first of two very adventurous courses. This one arrived at the table smouldering away and perfuming the restaurant with BBQ aromas. A very well thought out and inventive dish which was fun to eat. I knew I’d made the right decision booking the restaurant as soon as this course arrived…I got my happy face on . I had never eaten anything like this before and so the novelty factor , the smiles and the air of adventure had us both totally fascinated. The Shiitake mushroom spores are actually dormant in the “log” (or the growing medium) .It`s then sprayed with water twice daily and kept in a warm place to germinate. After 3 or 4 days the Shiitake Mushrooms actually grow out of the log and are ready to harvest. The whole log with mushrooms attached is then placed inside a “Big Green Egg” type of Barbeque device and that`s where the Mushrooms are cooked through and scented with the Charcoal smoke. The idea is to hold the mushrooms with a pair of Tweezers and snip them off with surgical scissors. 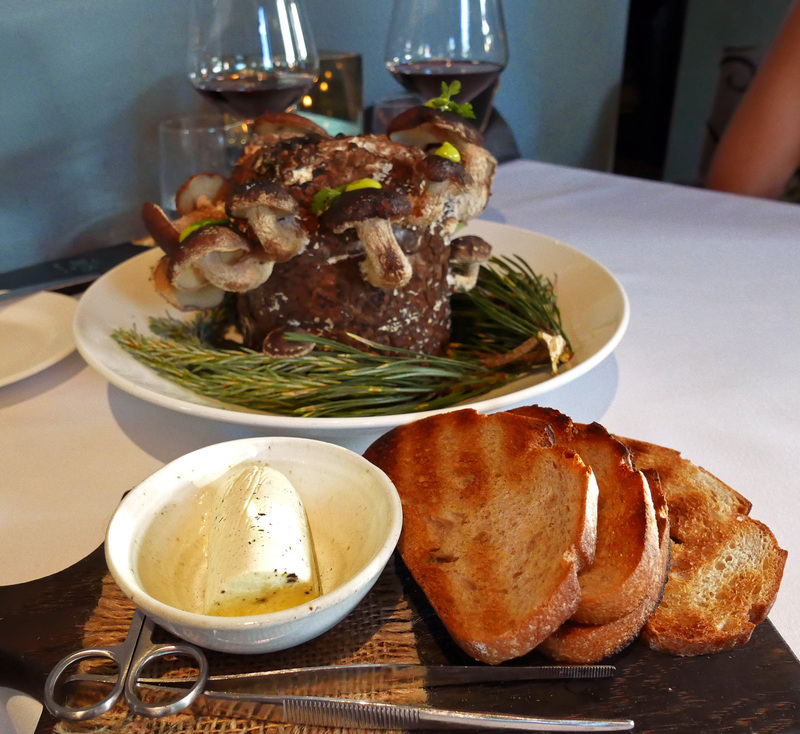 The grilled Sourdough Bread is then spread with Truffle Butter and then topped with the Shiitake Mushrooms….and eaten. 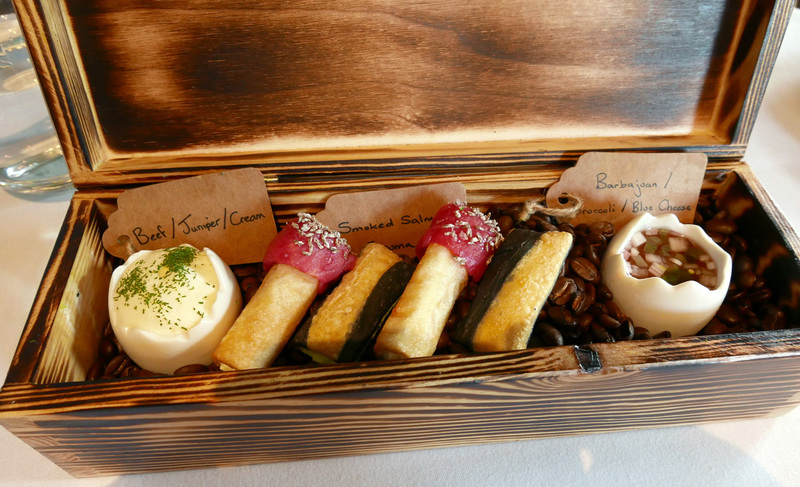 All in all this was a really fun and visually exciting course to eat and a whole new dining experience for us both. The flavour combinations worked well but could definitely be taken to another level with a couple of little tweaks. I would have brushed the mushrooms with a little Charcoal oil or smoked Butter to enhance the smoke flavour before they went into the BBQ as the BBQ had dried them out slightly. Then a nice grating of fresh Truffle over the Truffle butter would have elevated the dish to a totally new height. 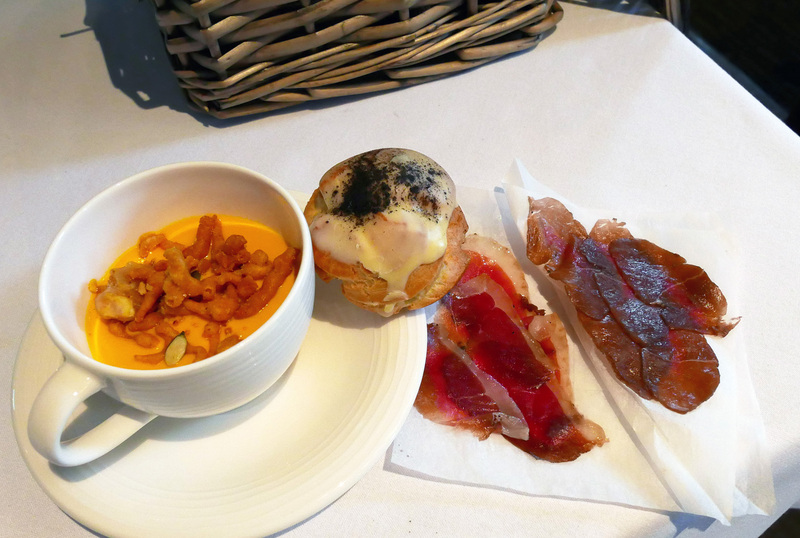 Picnic – Bombay mix , Carrot , Charcuterie , Gougere. 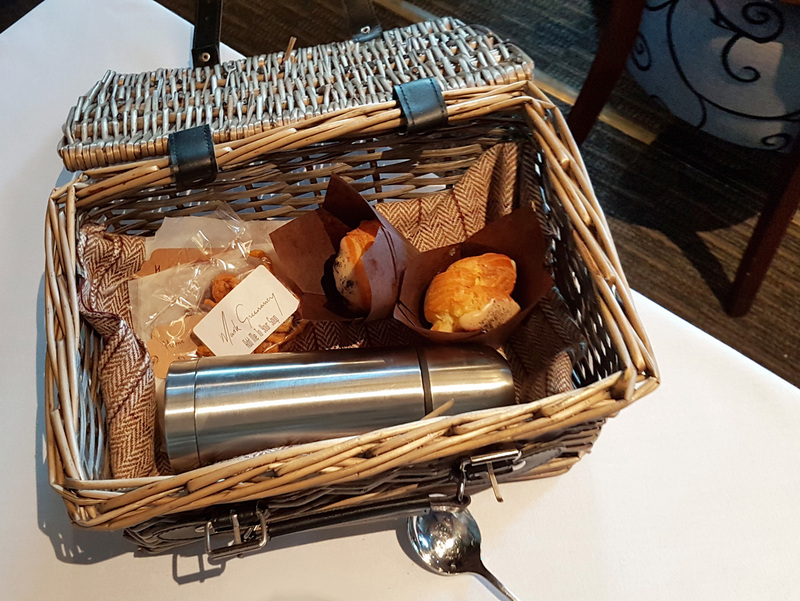 This one arrived at our table in a Wicker Picnic basket and contained a stainless steel flask and a couple of packets. We were just told to “Enjoy your Picnic” and so basically we had to find our own way to experience the contents. 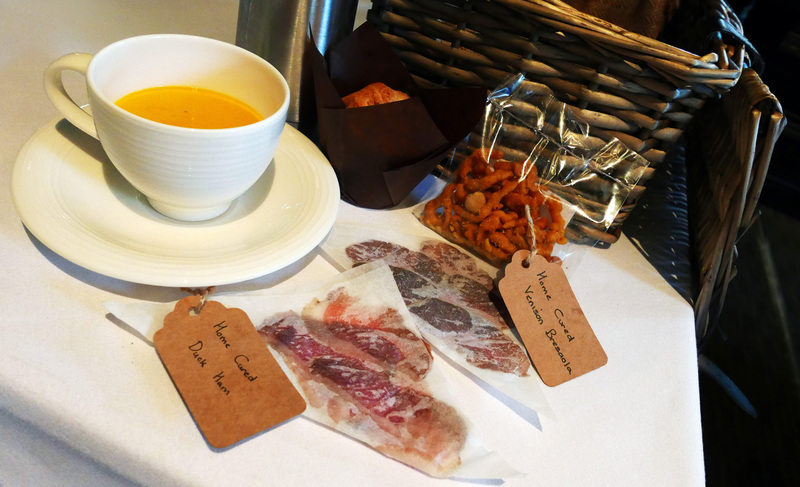 The flask contained a stunning , velvet smooth Carrot Soup which we topped with the homemade Bombay mix, an awesome combo. There was also two little envelopes containing house cured meats. A couple of slivers of Duck Ham and the same of Venison Bresaola. To finish the Picnic off we had an iced Choux Bun containing a lovely Green Pea Mousse. We spread everything out on the table and thoroughly enjoyed our little Picnic…..another successful , new , different and fun course. 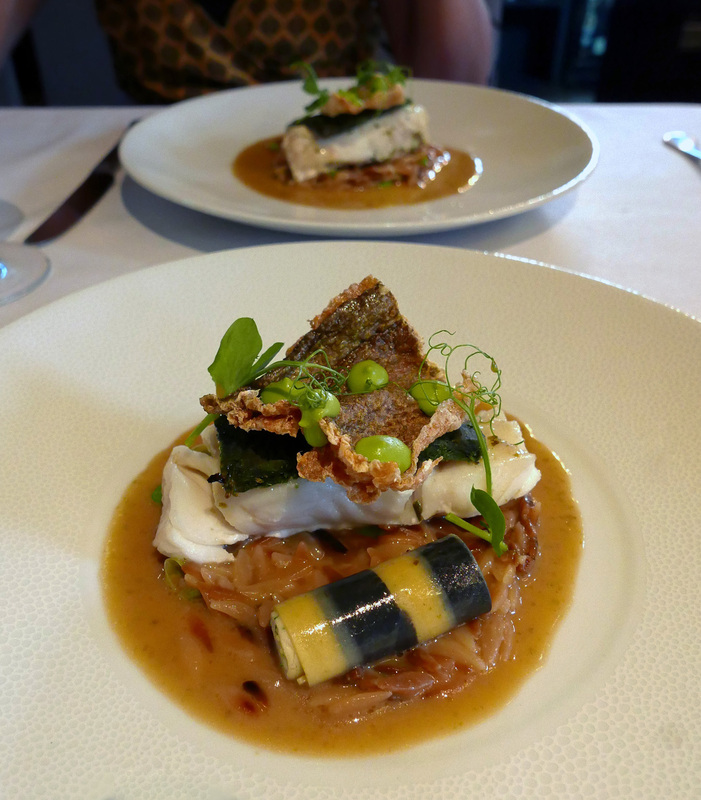 Cod fillet , Orzo , Fermented Seaweed Butter , Peas – Ok , so now we move on to the serious cooking. 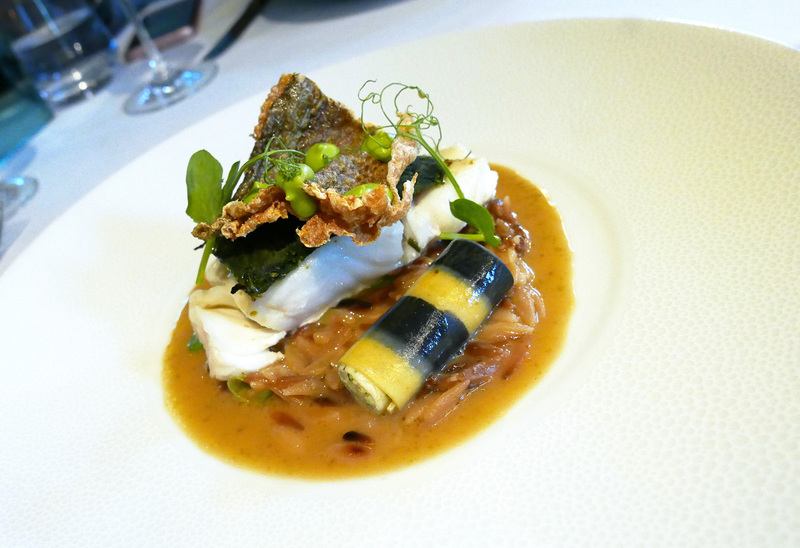 The generous fillet of Codfish was well cooked and topped off with a pave of Seaweed and a really crispy Cod skin. The creamy , Buttery Orzo sauce worked well with the Cod and all in all this was a lovely course. 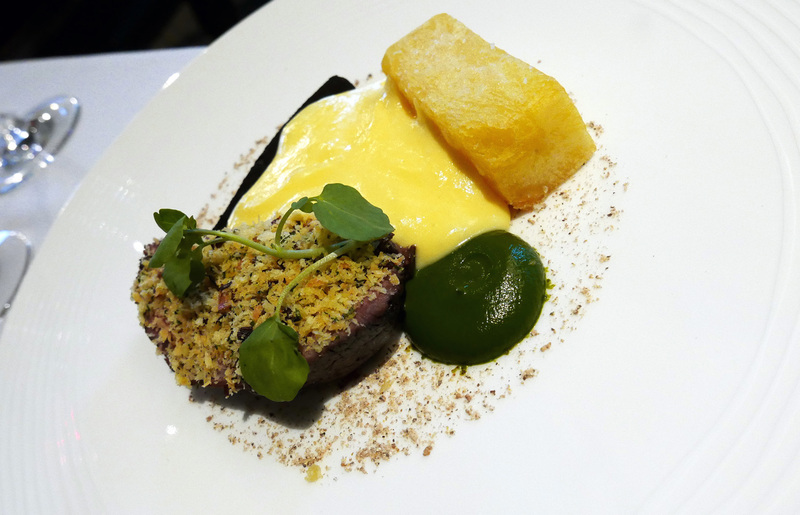 Aged Aberdeen Angus Beef , `Chip` , Watercress , Bone Marrow Hollandaise. 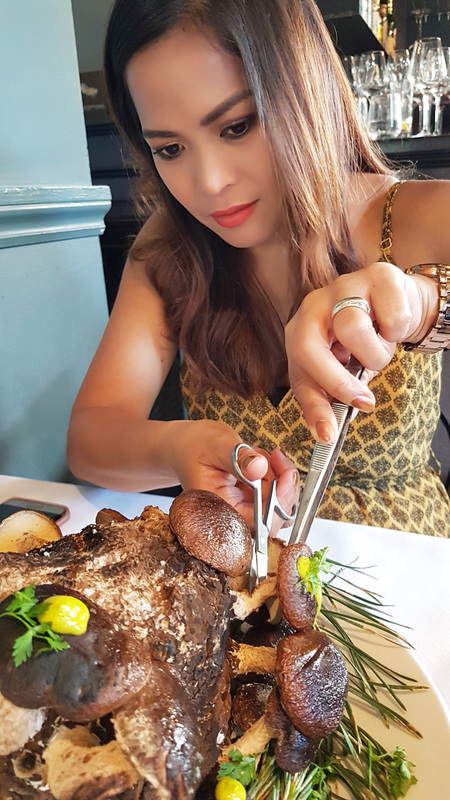 – The matured Beef was well flavoured and perfectly cooked but difficult to cut with the cutlery provided and quite chewy. 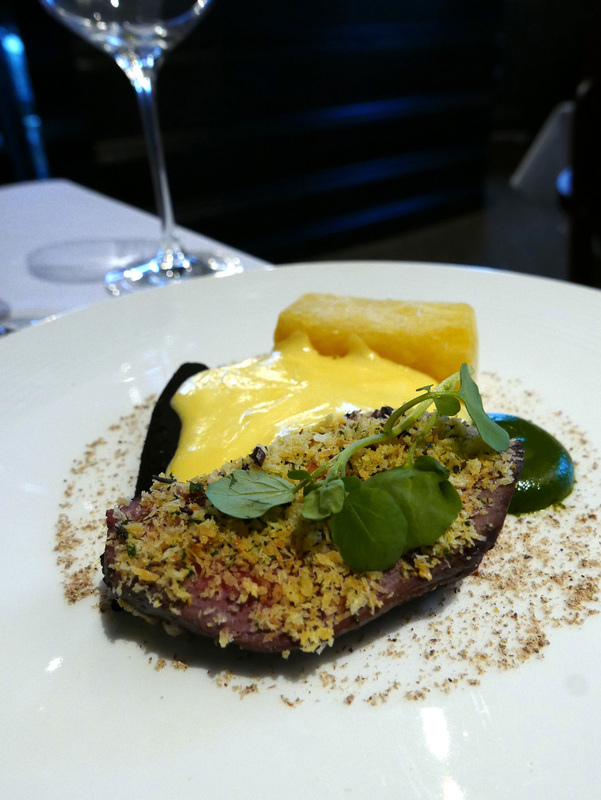 The combination of Potato “Chip” with the Beef and the Hollandaise was a totally winner as expected. I didn`t quite see the need for a single Carrot rolled in Ash but it tasted pleasant all the same. 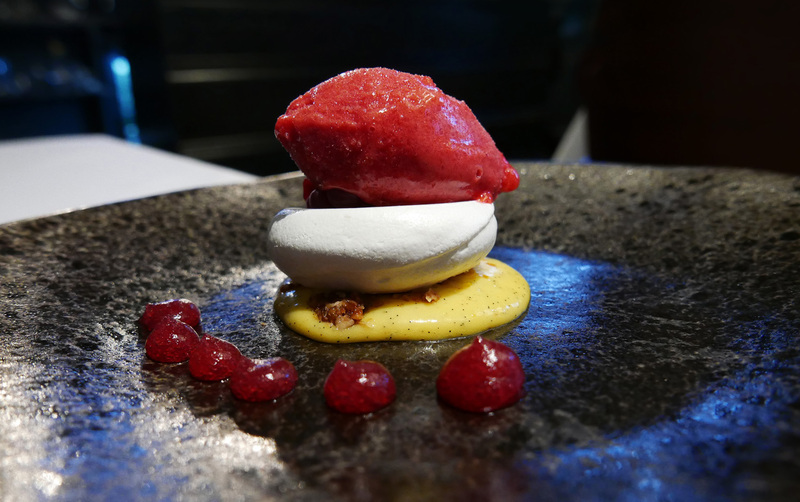 Raspberry , Meringue , Honey , Crisps. 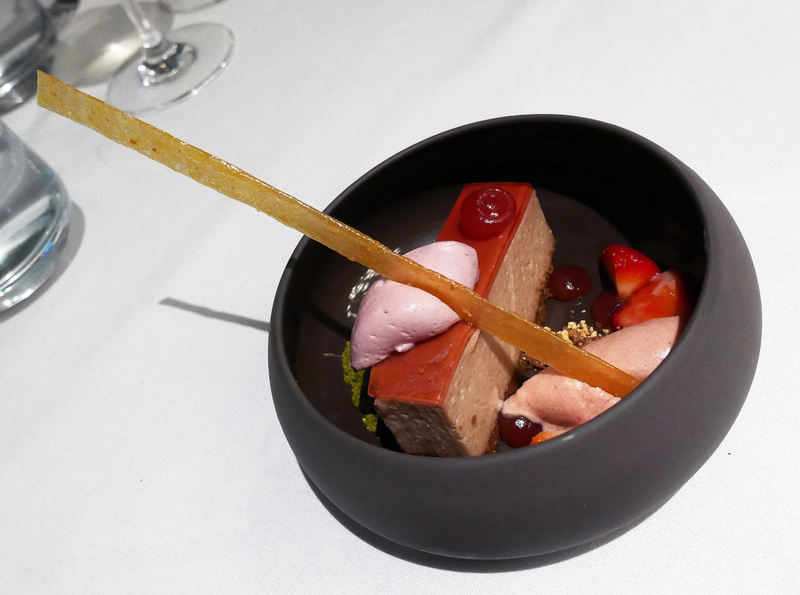 Baked Strawberry Cheesecake , Violet , Jelly , Sorbet – A seasonal and pleasant end to the tour menu. Powerful flavours from the Strawberry components and the Violet. I love sweet combinations so it worked well for me. So a straight £75 for the food and £50 for a 7 glass wine flight rounded dinner off at £125 per person. The novelty courses won us both over and made the experience an enjoyable and memorable one. 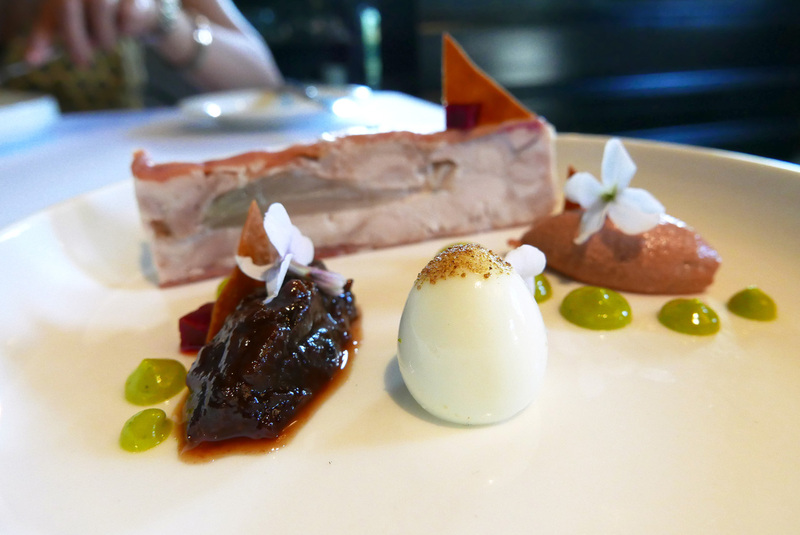 If you`re eating in Edinburgh then Restaurant Mark Greenaway has got to be a strong contender for your list. I`m off to google “Shiitake logs” now – I need to have a wee bit of fun at home with this one. Previous Post Askham Hall , Lowther Estates.